So let me tell you about Amara and the laundry. It has become kind of a thing between us. Amara has her own room here but admittedly I use her room for laundry when she isn’t here. Our washer and dryer are in the garage and the most convenient way to get there is from Amara’s room. And the most convenient place to put clean laundry — is on Amara’s bed. OK, so sometimes Grandma just happens to forget and leave clean laundry on Amara’s bed. Shame! The first time she became aware of my forgetfulness was probably 3 years ago. When she found laundry on her bed a second time it became a thing. The minute she would get here she would go running to her room to check up on me. And if there was laundry on her bed she would take me by the hand to her room and just kind of points at it — like “What is this doing here?” Sometimes I would leave laundry there on purpose just to see her face! A year later I wrote to my sister "Her personality and everything is exploding! I just love it and she picks up everything especially intonations and stuff. The kids came over the other day and I had laundry all over Amara’s bed — I knew I was in trouble! She walks in there and I hear this loud “OH MY GOODNESS! What happened in here Grandma?” I couldn’t help but laugh and scoop up laundry." A couple of weeks I was at her house and said I had to go home and finish laundry and she says to me — with that little gleam in her eye “and where are you planning to do this laundry?” Can you tell she likes to tease her Grandma? We both laughed about that one! This memory was posted in Grandparents, Indoor Fun, Previously on Amara and tagged Amara, Grandma, laundry on May 17, 2010 by Grandma Kc. I love your memories!!! And you know Amara is going to remember these times as well. Probably EVERY time she does laundry! Thank you again, Honey for sharing these special times with all of us! So funny to have the tables turned, as it’s usually the adult chastising the kiddos for the laundry. Isn’t it interesting the things that become “our thing” between a grandma and a grandchild. I love the laundry “thing” you and Amara share! That is cute! It reminds me of a time I was at the twins’ house when they had just begun to pick up on saying “stupid”. Mommy would make them sit in “time out”. I accidentally said “stupid” and they both escorted me to Time Out! Thank goodness I didn’t have to sit there one minute for each year of my age like the boys do. I’d still be there! Your stories bring such good thoughts to mind! Thank you and KEEP WRITING! Very cute story; the other day I sat down with a plate of food on the sofa and one of mine noticed and reminded me of the rules. “food and drink in the kitchen” I had to admit that that was right! Little stinker! I went to get a refill on strawberries for Bree last. Got distracted in the kitchen. A few minutes later I hear, “Hey! What’s the hold up on those strawberries?” Ahh, little girls! They just love it when things like this happen! 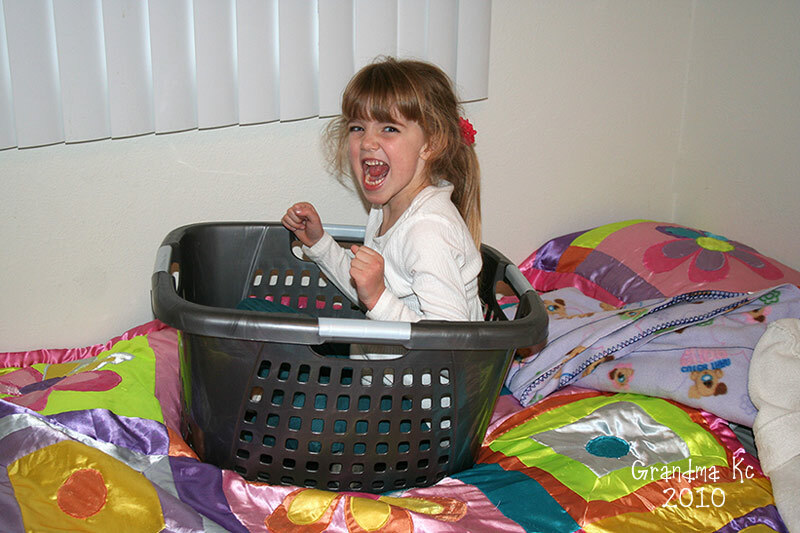 And I am guessing that your little lady no longer fits in that laundry basket….??? Do not challenge Amara to get in that laundry basket because no challenge goes unaccepted! I do think she and Bree are a lot like – beautiful little Princesses well cared for by their Grandmas! Kc, you’ve got to get Amara to help you with the laundry! I doubt I could get her to help with the laundry but I will say this – she is much better about getting her clothes to the clothes hamper here then she is at home! Made me smile even more to see you joining the GRAND Social. ? I don’t know why that won’t work but I felt the love!